As an attacker, initial access can prove to be quite the challenge against a hardened target. When selecting a payload for initial access, an attacker has to select a file format that allows arbitrary code execution or shell command execution with minimal user interaction. These file formats can be sparse, which is why attackers have relied on file types like .HTAs, Office macros, .VBS, .JS, etc. 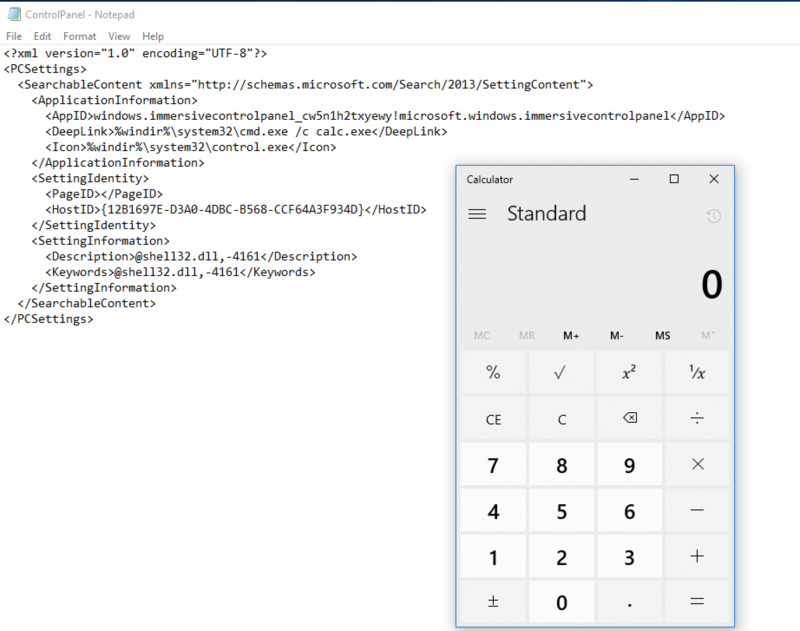 There are obviously a finite number of built-in file extensions on Windows, and as defenses improve, the number of effective payloads continues to shrink. When you combine OLE blocking and ASR together, the options to execute code on an endpoint from the internet become a little more limited. Most useful file types can’t be delivered via OLE per the new block in Office 2016, and ASR’s child process creation rule prevents any instances of a child process spawning under an Office application. How could we circumvent these controls? I first decided to tackle the file format problem. I spent a lot of hours going through the registry looking for new file formats that might allow execution. Most of these formats can be found in the root of the HKCR:\ registry hive. The process involved pulling all of the registered file formats out and then looking at them to see if the format itself allowed for anything interesting. All this file does is open the Control Panel for the user. The interesting aspect of this file is the <DeepLink> element in the schema. This element takes any binary with parameters and executes it. What happens if we simply substitute “control.exe” to something like “cmd.exe /c calc.exe”? What is interesting is that when double-clicking the file, there is no “open” prompt. Windows goes straight to executing the command. Great! So we have a file format that allows shell command execution via a file open. This solves the “what file format to use” problem of initial access. Now, how can we deliver it? My next thought was to see what happens if this file comes straight from the internet via a link. When looking up the ZoneIds online, “3” equals “URLZONE_INTERNET”. For one reason or another, the file still executes without any notification or warning to the user. So, we now have a file type that allows arbitrary shell command execution and displays zero warnings or dialogues to the user. When trying to get initial access, going across a target’s perimeter with an unusual file type can be risky. Ideally, this file would be placed in a container of a more common file type, such as an Office document. 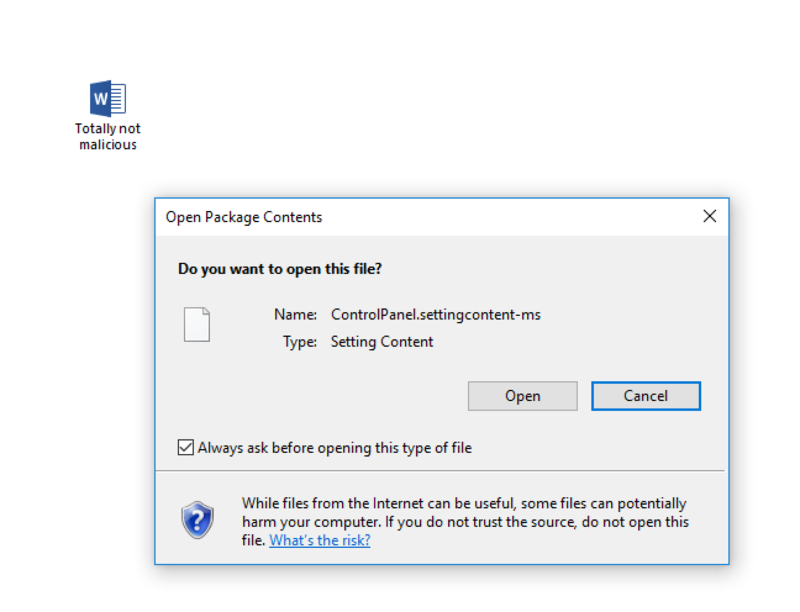 When a document comes from the internet with a .SettingContent-ms file embedded in it, the only thing the user sees is the “Open Package Contents” prompt. Clicking “Open” will result in execution. If an environment doesn’t have any Attack Surface Reduction rules enabled, this is all an attacker needs to execute code on the endpoint. I was curious, so I poked at how this holds up with ASR’s child process creation rules enabled. It is also worth noting that at of the time of this post, ASR rules do not appear to work on Office if Office was installed from the Windows Store. The <rule ID> parameter is the GUID of the rule you want to enabled. You can find the GUID for each ASR rule documented here. For this test, I want to enable the Child Process Creation rule, which is GUID D4F940AB-401B-4EFC-AADC-AD5F3C50688A. Since the rule is designed to block child processes from being spawned from an Office application, our payload executed, but the rule blocked the command. This got me thinking into how ASR achieves that without breaking some functionality. I first started to just test random binaries in random paths to see if ASR was blocking based on the image path. This was quite time consuming and didn’t get me very far. I ended up taking a step back and thinking about what parts of Office have to work. 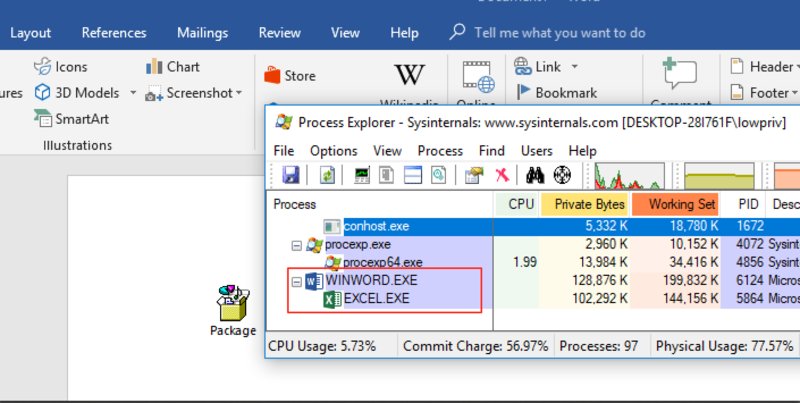 After running ProcMon and looking at Process Explorer for a little bit while clicking around in Word, I noticed that there were still child processes being spawned by Word. This makes sense, as Office needs to use features that rely on other programs. I thought that maybe the ASR rule blocks child processes based on image path, but images in the Office path are allowed to be spawned when features are activated. The next step is to embed this new file into a Word document and see if ASR blocks “Excel.exe” from being spawned. Interestingly enough, ASR allows Excel to start. So the child process creation ASR rule appears to be making decisions based on whitelisted paths. After looking into ASR and the new file formats in Windows 10, I realized that it is important to try and audit new binaries and file types that get added in each release of Windows. 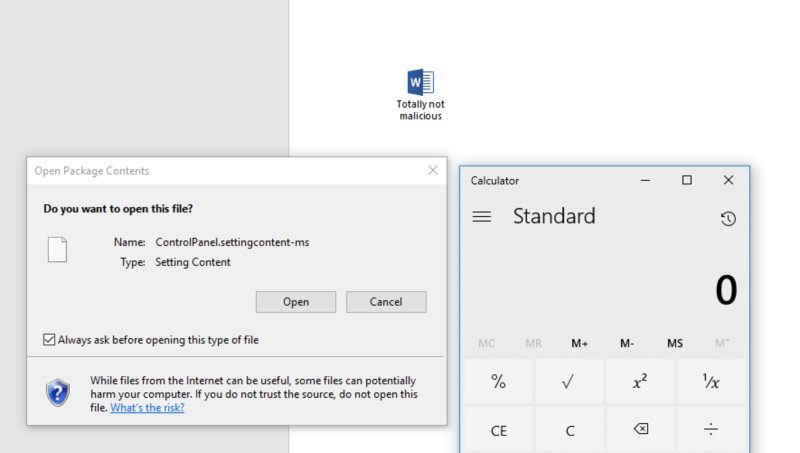 In this case, the .SettingContent-ms extension can allow an attacker to run arbitrary commands on the latest version of Windows while evading ASR and Office 2016 OLE blocks. Additionally, the file type appears to give execution (even from the internet) immediately after it’s opened, despite having the MOTW applied. Great, so what can you do about it? Ultimately, a .SettingContent-ms file should not be executing anywhere outside of the “C:\Windows\ImmersiveControlPanel” path. Additionally, since the file format only allows for executing shell commands, anything being run through that file is subject to command line logging. It is also a good idea to always monitor child process creations from Office applications. There are a few applications that should be spawning under the Office applications, so monitoring for outliers can be useful. One tool that can accomplish this is Sysmon. Another option is to neuter the file format by killing its handler. I have NOT tested this extensively and can offer no guarantee that something within Windows won’t break by doing this. For those who want to play around with the implications of killing the handler to the .SettingContent-ms file format, you can set the “DelegateExecute” key in “HKLM:\SettingContent\Shell\Open\Command” to be empty. Again, this might break functionality on the OS, so proceed with caution.